I work with Tuscan Hills in Kingston/Princeton for clients that want pots imported from Italy. Their selection is lovely whether it be contemporary or old world in taste. I can help with tasteful selections and help clients with proper plant selection for the exterior space. I take into consideration the sun exposure or lack thereof and a clients skillset in maintaining these plants. . 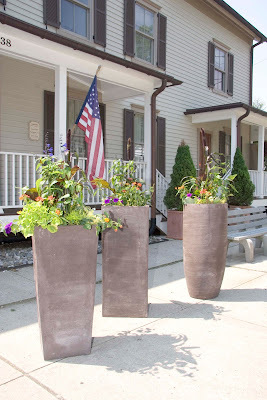 Remember the easiest way to make a small space alive is with some container pots on a patio. terrace or porch! Sometime the best thing you can do as a store owner is some containers for landscape. I love working with black containers for contrast. It is important to make sure that plants chosen suit the site and have water needs that are very similiar. Also these annuals need to be fertilized throughout the season for abundant blooms. I chose hibiscus, exotic geraniums , succulents and grasses. Spring is here in Central Jersey! I love planting Creeping Jenny because of her chartreuse color that pops in the shade and looks wonderful in container pots as it cascades down the sides. It returns every spring because it is a perennial. This is only a wee look at some of the containers that I have on my property. Many, I plant dwarf specimen hostas that return every year and even ferns in some of the pots. Don't forget to add some things that are special so that visitors will know that they are invited into your space. Wrens are my most favorite birds for many reasons and it is some folly to see one in the garden all of the time. Copper sundials hearken back to another time and I take any opportunity I find to place a pot! Sometimes simplicity is at its best with some violas for spring in an aging pot. It is that time of year that if you are a gardener for a living or pleasure you are busy! 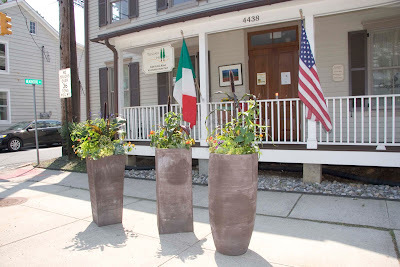 Hopewell is lucky enough to await The Bell and Whistle coming to town and I have started their container plantings as we all wait for them to open. I love to install container plantings for my clients either for commercial or home pleasure. Things to take into consideration are location of the sun or lack thereof, mood of installation, maintenance, and differing heights of plants and textures. I love doing them! !